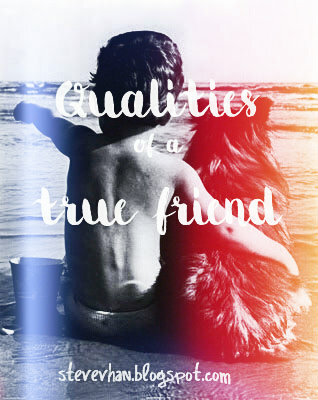 Qualities of a true friend (In a Nutshell). Do you think you have found a true friend? well, here are some qualities to help you know if your friend has a quality of that true bestie! 1.YOU CAN LEAN ON - well, not just about literally "lean on his/her shoulder" but this is more of an intangible one. Whenever you are down, this friend of yours will stick with you and get your feet back up if everyone else fails to be around. Instead of judging you, this one lifts up you up, accept who you are and will definitely supports you all the way to the end. 2.YOU CAN LAUGH WITH - When you look that friend in the eye, you easily get what he/she means. When you bully someone, when your friend cracks a joke, there's no explanation needed to get that joke straight in your humour, you just have to laugh cause you have the same wavelength. "Great minds think alike" folks. 3. YOU CAN CONFIDE WITH - True friends are those who's not only there in your sunshine, but those who will be there with you in your darkest. If you have that kind of friend, you should have her/him on your side for your lifetime. 4. WHO CHEERS YOU UP WHEN YOU'RE ALONE - Ok, that's pretty explained in number 3 and number 1. Sometimes you find that friend annoying when he/she says "nuuuhhhh! Stop it! you have to look at the brighter side of this situation, the world is a sunshine, stop the drama, let's get crazy" ----- cause sometimes, dramas aren't fun. 5. WHO LISTENS TO YOUR TROUBLES AND WOES - Alright, so you have a lot of troubles with you. You failed your exams. You broke up with sometime. You're hysterical. Worst case is, your suicidal!!. Good for you! you have that friend who sees your woes and see your inner core, instead of talking, he/she just felt like you just needed someone to listen all the rants that you have about the chaos in your life for the moment. 6. WHO KNOWS WHAT TO DO TO CHEER YOU UP - Pizza, wine, a place, a game. Perharps a movie? That friend of yours know exactly what to do if in case you need some push from your situation, just like a fairy god mother!. 7. ACCEPTS YOU WHETHER GOOD OR BAD - Just like any road, friendship can be tough sometimes, the roads are smooth and bumpy. Both of you knows when to give, retreat, surrender, fight and forgive at the perfect timing, but quitting is never in the equation. Good or bad the situation is, your friend will never leave your friendship. 8. UNDERSTANDS YOU NO MATTER WHAT - Basically putting his/her shoes in your situation with no judgement at all. Still, he knows just and the consequences of the situation. 9. BACKS YOU UP WHEN YOU'RE IN TROUBLE - Avengers assemble! When you're friend has that face like "The Hulk" when you're bullied and is also willing to save you from this cruel wounded lost dark world, that's truly a friend! He's /She's gonna go green hulky for you bud! So have you found the one? who's that person riddling in your mind while reading those qualities? maybe, that's your true friend!. May I add? For me, a true friend will tell you the truth no matter how painful it is because the truth sets a person free. A great friend is a person who can tell you the truth that is packaged in love. Nowadays it's easy to lo0k for go0d friends but hard to find true friends. soo true! and a true friend will just open the gate of your house and will go straight to your fridge to get some food. hahaha! well said! :) true friends are real treasure..